The completed systems interchange joining Interstates 22 and 65 at North Birmingham. Photo taken 10/08/16. Interstate 22 overlays U.S. 78 from Tremont, Mississippi to Graysville across northwestern Alabama. Following a rural route, I-22 connects the cities of Hamilton, Guin, Winfield, Carbon Hill and Jasper with the north Birmingham suburbs and Interstate 65 at Fultondale. The scenic freeway is a part of a regional link between Birmingham and Memphis, Tennessee. This view looked south from the 47th Avenue overpass during construction of the directional T interchange joining Interstates 22 and 65. Photo taken 10/21/12. 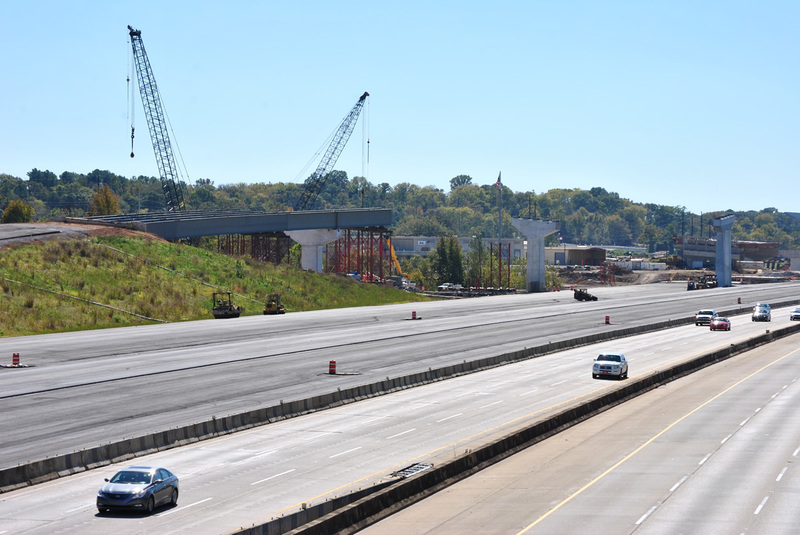 Initially planned for completion on October 15, 2014, several delays hampered construction on the easternmost 2.5 miles of I-22. The project was pushed back to August 2015, and again into the following year. 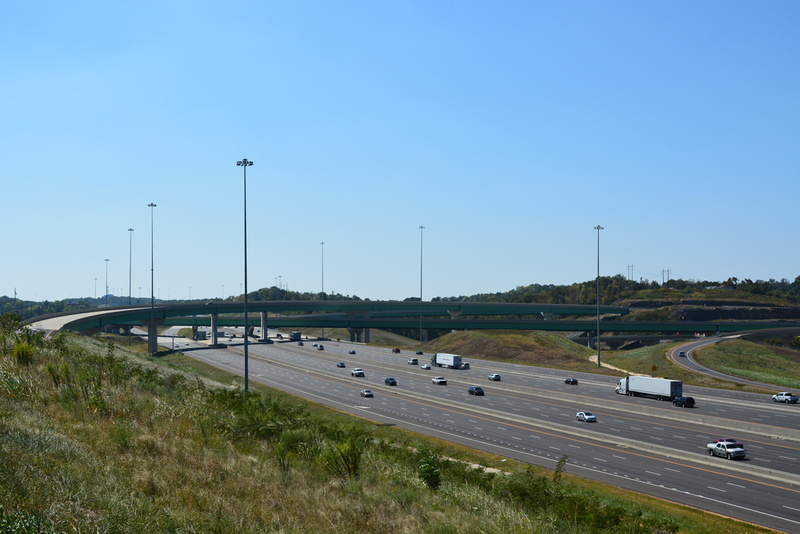 The interchange with Interstate 65 finally debuted to motorists on June 20, 2016. These special blue & white Appalachian Regional Corridor X shields were in use all along the 30-mile Mississippi to Winfield segment of Interstate 22. Alabama 4 is the unsigned state route counterpart for U.S. 78 across the state, but is signed periodically along this segment of freeway. Photo taken 09/25/03. Interstate 22 ended temporarily at Alabama 129 until November 22, 2005. Photo taken 09/25/03. The one half mile guide sign for U.S. 78 and Alabama 129 at Exit 30 and the temporary end of Interstate 22 near Winfield. Note that Birmingham, the U.S. 78 eastbound control city, was the only featured. The freeway resumed 25 miles to the east via U.S. 78 east and Alabama 129 south. Photo taken 09/25/03. A side profile of the Exit 30 guide sign at the temporary east end of the first Corridor X freeway segment in Alabama. Photo taken 09/25/03. Looking eastward at the temporary end of Interstate 22 east at Exit 30. The freeway opened to traffic between Alabama 129 and Alabama 118, west of Jasper, on November 22, 2005. Photo taken 09/25/03. Westward perspective from the eventual westbound lanes of Interstate 22 at the Exit 30 stub interchange. The Hamilton area segment of Corridor X consists of four overall travel lanes. Photo taken 09/25/03. Construction was well underway at the diamond interchange joining SR 13 with I-22 north of Eldridge. This ramp opened in November 2005. Photo taken 09/25/03. The overpasses that now shuttle Interstate 22 over Alabama 13 were essentially done at the time of this photo, but were not open to traffic for another two years. Photo taken 09/25/03. The Jasper segment of Interstate 22 concluded at Exit 52, four miles to the east of Carbon Hill. Temporary U.S. 78 ends signs were posted at half mile intervals. Photo taken 09/25/03. View of the unopened westbound travel lanes at the temporary beginning of Interstate 22 west within the diamond interchange at Exit 65. Photo taken 09/25/03. Westward view of Interstate 22 from when the freeway ended at Industrial Parkway. Photo taken 09/25/03. A historical look at the temporary end of freeway at the Industrial Parkway interchange south of Jasper. Note that the freeway was constructed with six overall lanes westward to Exit 63. Photo taken 09/25/03. The eastbound on-ramp to Interstate 22 from Industrial Parkway Road (Exit 65) under construction. This ramp opened on November 14, 2007. Photo taken 09/25/03. Looking to the west at the Industrial Parkway interchange (Exit 65) from a perch high above the eastbound lanes. Photo taken 09/25/03. Whitehouse Road travels east from Industrial Parkway parallel to Interstate 22. This view looks from just north of the adjacent road at Corridor X during its construction. The freeway overtook a portion of the original Whitehouse Road alignment, resulting in an adjustment of the road north across I-22 to East Lake Road. Photo taken 09/25/03. A generous rock cut, representative of the rocky nature of the Appalachian Piedmont, is evident along Interstate 22 between Whitehouse and Walker County Lake Roads, east of Exit 65. Photo taken 09/25/03. Industrial Parkway northbound at the full diamond interchange with Interstate 22 during construction. Photo taken 09/25/03. This eastward scene looks at what is now the westbound off-ramp of Interstate 22 onto Industrial Parkway. Photo taken 09/25/03. Looking east from the U.S. 78 & Alabama 5 overpass at the unopened Interstate 22 (Exit 85) in Graysville. When the stretch of freeway west to Jasper opened in 2007, U.S. 78 through Sumilton was signed as Alabama 5 alone. Photo taken 09/25/03. Westward view of the Interstate 22 travel lanes from the U.S. 78 and Alabama 5 overpass within the six-ramp parclo interchange at Exit 85. Photo taken 09/25/03. "Two more portions of Corridor X opening." Mobile Press-Register, November 1, 2007. "DOT set to open more of Corridor X." Mobile Press-Register, June 3, 2007. "Corridor X open from Jasper to Memphis." Mobile Press-Register, November 23, 2005. "Interstate signs set to go up on Corridor X." Mobile Press-Register, April 17, 2005. "Birmingham I-65/Corridor X project set to launch Aug. 1." The Birmingham News, July 26, 2010.